Students in Erin Walter’s kindergarten class at Lynchburg-Clay Elementary recently collected supplies to send to military personnel who are currently deployed. The class learned about the sacrifices that people in the military make to keep others free and safe. The names of four servicemen were then nominated to receive packages that included many treats, activities and hygiene products, as well as handmade cards and signs. The packages were sent to Italy, Iraq and Japan. Members of the class are pictured. 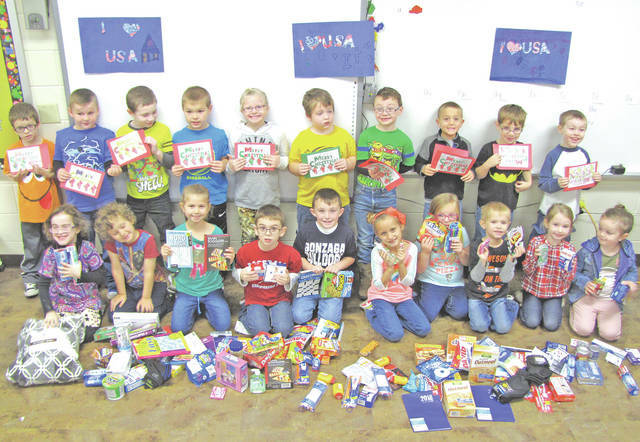 https://www.timesgazette.com/wp-content/uploads/sites/33/2017/12/web1_Service-project-pic.jpgStudents in Erin Walter’s kindergarten class at Lynchburg-Clay Elementary recently collected supplies to send to military personnel who are currently deployed. The class learned about the sacrifices that people in the military make to keep others free and safe. The names of four servicemen were then nominated to receive packages that included many treats, activities and hygiene products, as well as handmade cards and signs. The packages were sent to Italy, Iraq and Japan. Members of the class are pictured.